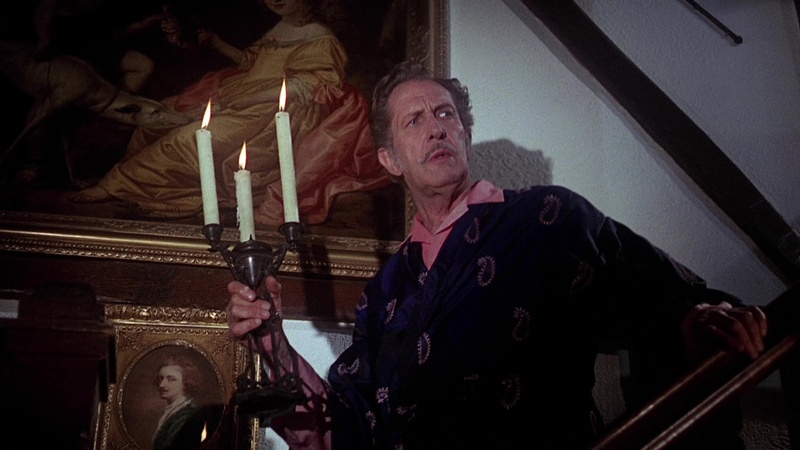 The last bona fide horror star vehicle for Vincent Price, this co-production between British horror specialists Amicus Productions and U.S. drive-in king AIP is often regarded as a swan song of sorts for the type of horror films being usurped at the time by more savage fare. The entire film is essentially a love letter to Price's career complete with roughed-up snippets of his famous AIP Poe films (which led many to compare it to the earlier Targets), and while the film wasn't released as widely or revived as often as many of his more famous films, the indelible skull-faced image of his Dr. Death character provided him with his most memorable post-Phibes appearance on film. 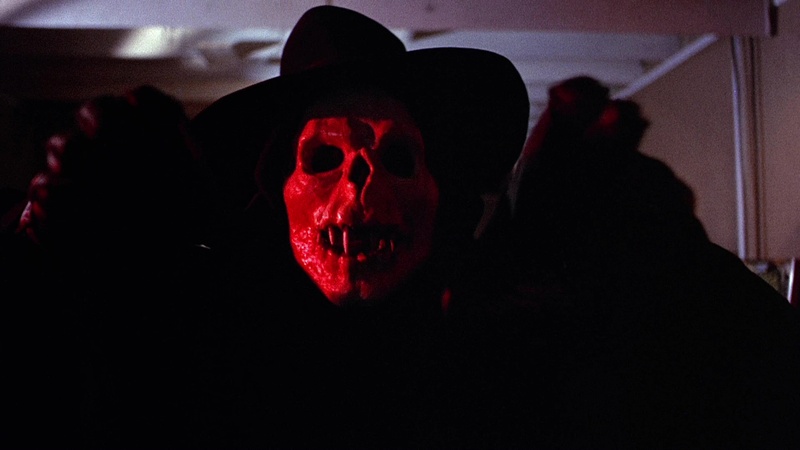 Years after retiring his famous Dr. Death character, actor Paul Toombes (Price) is eager to get on with his career in a decidedly no-horrific direction, especially after his wife gets her head lopped off during a showbiz New Year's Eve party. Now after extensive therapy he's back on his feet and reluctantly agreeing to reprise his most famous character in a British TV series, but someone starts killing off people involved in the production while wearing a creepy skull mask and brandishing a nasty knife. 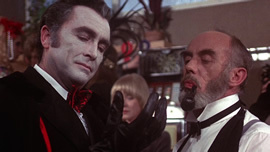 Among the suspects are the arrogant producer Oliver Quayle (Quarry, who nods to his most famous role in Count Yorga, Vampire during the costume party scene) and Paul's writer, Herbert (Cushing), who once nursed dreams of acting stardom himself. However, Paul starts to think that perhaps he is responsible for the murders himself... and Dr. Death might be more than just a fictional character. Despite the presence of gothic horror icons in its cast, Madhouse is easy to peg now as one of the forerunners of the modern slasher film with a knife-wielding mystery man picking off the cast for motives unknown. The black gloves and wild skull mask also make it tempting to tie this in with the giallo and krimi films pouring out of Italy and Germany, but the execution is far closer to the American and British slasher film with one particular standout being a nocturnal stalking sequence involving the always wonderful Linda Hayden (Blood on Satan's Claw). 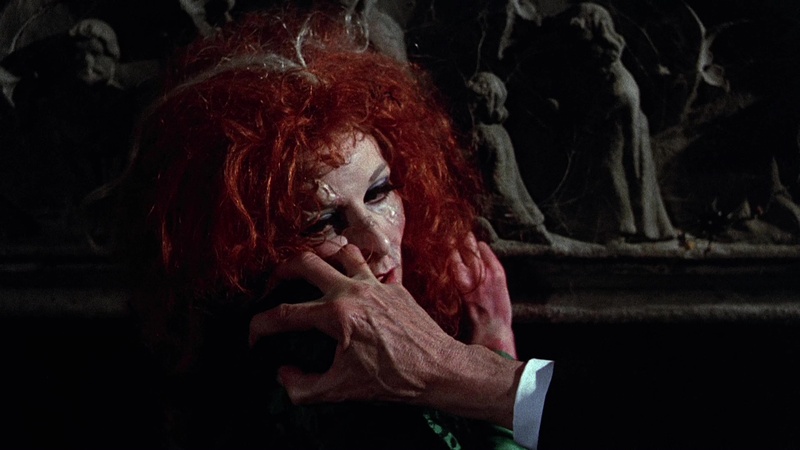 The film also includes other surprising elements, most notably some wild sequences with Adrienne Corri as wig-wearing loon enraptured with spiders and a bizarre double-twist ending that introduces a potentially supernatural element into the proceedings. 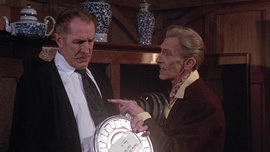 The main attraction here is the three stars, obviously, with Price bidding a temporary adieu to the horror genre and AIP with a performance worthy of his more iconic appearances. It's great to finally see him and Cushing finally sharing scenes together (after a couple of projects in which they appeared separately), and of course they would team up again nine years later for The House of the Long Shadows. Film editor Jim Clark (who had worked on such films as The Innocents and Darling) was brought to direct this film, an odd choice considering he only had a tiny handful of helming credits to his name at the time including Rentadick and Every Home Should Have One. His mostly flat visual style and lack of feeling for the genre are unfortunate, and it's no wonder he didn't direct another film after this; one can only wonder how it would have turned out with original choice Robert Fuest on board. The script is also a bit odd, lifting a tiny handful of elements from its source novel (the sataism-themed Devilday by Angus Hall) with Quarry reportedly rewriting much of his and Price's unworkable dialogue. Therefore, horror fans will find this a real treat if they don't focus too hard on trying to piece everything together and just enjoy seeing a trio of icons doing what they do best. Like many of the AIP films brought over to the Orion library in the '80s, Madhouse suffered from some musical tinkering with Price's charmingly nostalgic rendition of "When Day Is Done" wiped off the soundtrack for VHS and TV airings. (A similar fate befell his closing song in Dr. Phibes Rises Again around the same time.) Things improved somewhat with the old MGM DVD, which featured a non-anamorphic transfer and originally bowed as one of this frustrating Midnite Movies exclusives at Best Buy in a double bill with Theatre of Blood, with the same transfer rehashed later as a budget reissue with Masque of the Red Death. The much-needed 2015 revisit from Kino Lorber finally presents a beautiful HD presentation on the Blu-ray release, with a simultaneous DVD marking its anamorphic debut in that format. The feature can also be played with an audio commentary by regular Price commentator David Del Valle, who offers a thorough snapshot of the star's career at the time, the state of AIP and Amicus, and the star's personal life at the time. 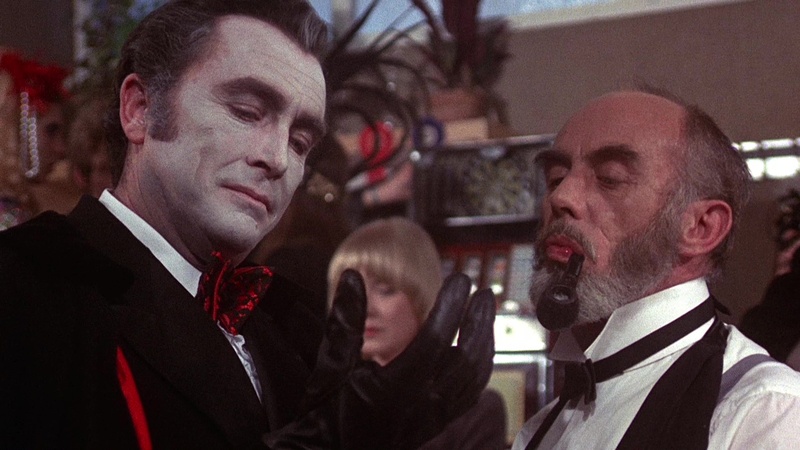 Apart from a few factual slips (like calling Tales that Witness Madness an Amicus production), it's a brisk and informative history of the background of the film. 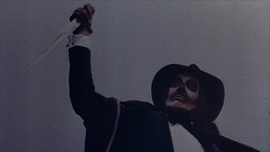 Clocking in just shy of 11 minutes, the Ballyhoo Motion Pictures featurette "Revenge of Dr. Death" takes its name from the feature's original working title and primarily uses narration to tie together the story of the film's inception and production with occasional filmed comments from Del Valle and C. Courney Joyner. It's an entertaining piece (apart from some jerky frame rate issues with clips from the main feature) with a nice, clean narrative approach to how the film slots into Price's career at the time during a transitional period for the genre. Trailers for Madhouse and Tales of Terror are also included. Reviewed on July 4, 2015.